Peace Officer Vision Requirements - Willa Hisle, O.D. Congratulations if you have started the process to become a California Correctional Officer. If all is going well, you have passed your written examination and your physical fitness tests. The difficult part of the selection process is over. Now you have your evaluations, a background check, an interview and your pre-employment medical examination, oh and one more thing… your vision test! Did you notice that this one item is so important and that it is a selection component all on its own? Failing the vision test can disqualify you for a year. Below I will explain what is required to pass the vision test and why you should have your eyes examined before you even start the application process. Dr. Hisle has worked with candidates that have completed all of the other selection components only to find out at the end of the process that they needed to be fit with contact lenses in order to pass the vision component; but, because they hadn’t worn contact lenses for at least a year they were “disqualified” and had to wait a year to reapply. If you are seriously considering applying to become a California Peace Officer, have your vision checked NOW! If you need contact lenses to correct your vision, you can be an established contact lenses wearer by the time you take your vision test if you plan ahead. Confusing? 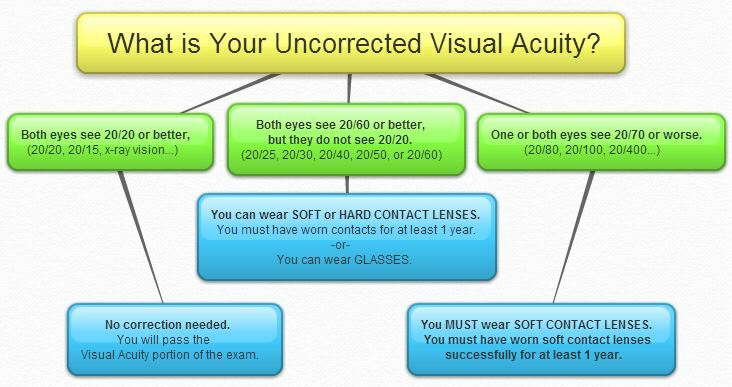 The chart below should help you understand the vision requirements. Now make sure you don't have any issues with your color vision. ​Of course you don't, but check it just the same!